The simple‐seeming gift of a few cattle given to Kamehameha I by Captain George Vancouver in 1793 made a major impact on the Hawai`i’s economy and ecosystem. It also spawned a rich tradition of cowboy culture that is still here today. When Vancouver landed additional cattle at Kealakekua in 1794, he strongly encouraged King Kamehameha to place a 10‐year kapu on them to allow the herd to grow. In the decades that followed, cattle flourished and turned into a dangerous nuisance. By 1846, 25,000-wild cattle roamed at will and an additional 10,000-semi‐domesticated cattle lived alongside humans. Kamehameha III lifted the kapu in 1830 and the hunting of wild cattle was encouraged. Hawaiʻi’s wild cattle population needed to be controlled for safety reasons, but the arrival of cattle hunters and Mexican vaquero (“Paniolo”) also happened to coincide with an economic opportunity. Now, roaming nearly 750,000-acres of pasture land (as of January 1, 2013,) the total number of cattle and calves on Hawai‘i’s ranches was estimated at 132,000-head. Of these, about 2,100 were milk cows; another 2,000 were milk cow replacements. Milk producer Meadow Gold Dairies Hawaiʻi traces its roots back to June 1897, when seven Oʻahu dairy farms formed a partnership to create a stronger presence in the marketplace. The organization, comprised of the Waiʻalae Ranch dairy, Kaipu Dairy, Mānoa Dairy, Honolulu Dairy, Nuʻuanu Valley Dairy, Woodlawn Dairy and Kapahulu Dairy, came to be known as the Dairymen’s Association. In order to promote more milk consumption, they later devised the ‘Healthy Baby Contest.’ The first took place in 1953 and, in cooperation with the Dairyman’s Association, was produced by the Honolulu Chinese Jaycees to promote healthy families in Hawai‘i. The Dairymen’s Association’s sponsorship of the original Healthy Baby Contest aligned with its community initiatives at the time ― to raise awareness amongst Hawai‘i families of the importance of nutrition and healthy lifestyles – and drinking milk. In 1949, the organization had already been taking a proactive approach in communicating and reaching out to Hawai‘i families and keiki when it introduced a young calf to Hawaiʻi, its Ambassador of Good Health and Nutrition. A children’s contest was held to name the calf. 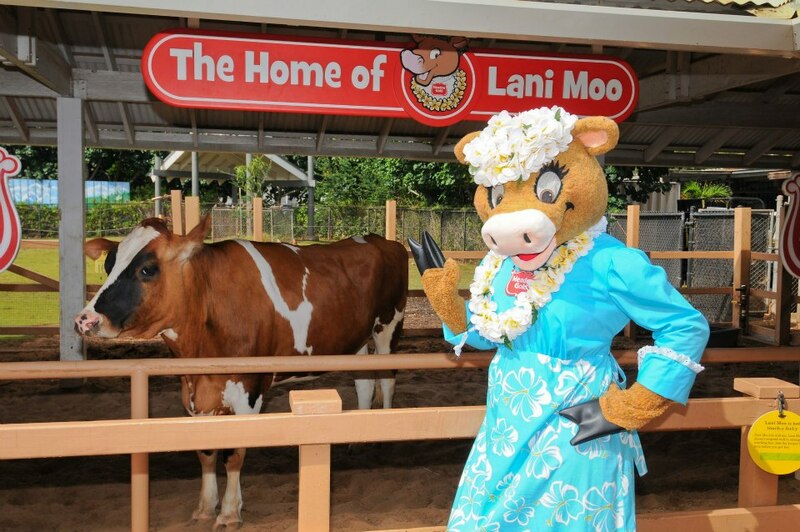 Over the years, the various Lani Moos had various homes – today’s dairy diva resides at the Honolulu Zoo. The Honolulu Zoo unveiled the Lani Moo Keiki Corner interactive educational exhibit, which teaches children about cows, milk and nutrition. In addition, a costumed Lani Moo (and side-kick Kawika) travels to various events to help spread the message. In 1959, the Dairymen’s Association, Ltd name changed to Meadow Gold Dairies Hawai‘i, and the name for the Healthy Baby Contest followed suit. Meadow Gold Dairies Hawai‘i has been the title sponsor of the O‘ahu Healthy Baby Contest for decades, and through a few incarnations. Later in 1986 the event was sponsored by Borden, Inc., which was the parent company of Meadow Gold Dairies Hawai‘i at the time. Contests are going on now across the islands to crown Hawaiʻi’s healthy babies. Click HERE for contest info. Our family had experience with the Healthy Baby Contest. Two brothers (my nephews) entered in 1996 and 1998, respectively. Unfortunately, young Jack White would rather have been elsewhere in 1996 (some photos in the album (he’s in the red palaka) show his various stages of tantrum.) He just entered college and probably has no memory of the event. The image shows two Lani Moo at the Zoo. In addition, I have added other related images in a folder of like name in the Photos section on my Facebook and Google+ pages.